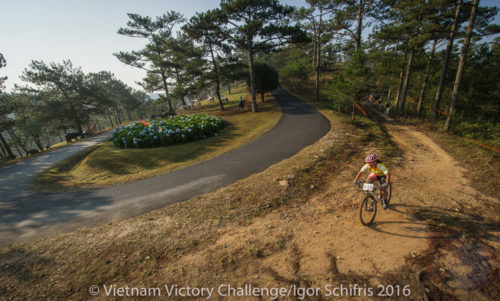 The Vietnam Victory Challenge is gaining momentum in its second year and has great reviews from the riders. Photo by Courtesy Vietnam Victory Challenge and Velo Vietnam. 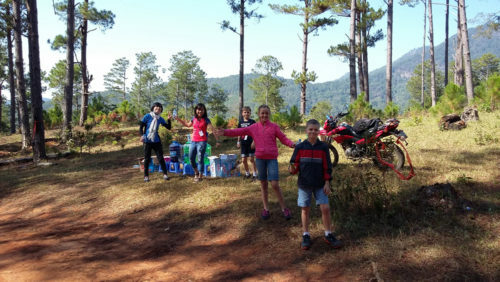 Da Lat, Vietnam: Earlier this year, a field of 148 local and international mountain bike riders lined up in the central highlands’ capital for the start of the second ever DDK Vietnam Victory Challenge. Cory Wallace, from the Rocky Mountain town of Jasper, and Sarah Kaufmann from Salt Lake City, both showed their class to defend their titles in the Pro-Men’s and Pro-Women’s categories. Building on the success of 2015’s inaugural race, a wide range of ability’s were again drawn to the enduro event. This year’s field included several pro and semi-pro riders, with the Open Women’s category led by Utah’s own Sarah Kaufmann. 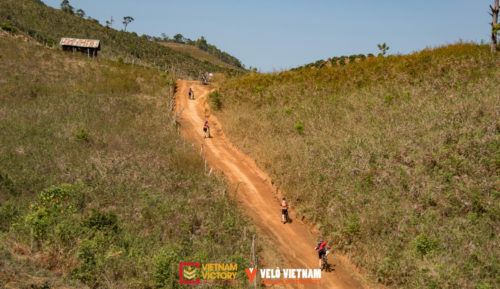 This years’ Vietnam Victory Challenge was again run over three stages, the first two being 48km A to B rides, including 1,300m of elevation gain, (the second stage a reverse of the first) followed by four laps of an 11km loop on the final day through the aptly titled “Valley of Love”, a hub for international and domestic visitors. In the Pro-Men’s category, Canadian national champion Cory Wallace, riding for the Kona factory team, virtually had it to himself again. In a repeat of last years’ result, Cory put light between himself and the competition, finishing the General Classification a clear 54 minutes in front of his nearest rival Sang Seyha from Cambodia. Beating everyone up the first climb on day one, he was barely sighted, demonstrating the gulf in class between the pro’s in nations where this is an established sport, and places like Vietnam, where it remains in its’ infancy. In the other categories, there were some great battles throughout the weekend, with yellow GC jerseys changing hands over the three stages. This happened most notably in the Men’s 30-39 category which was eventually taken out by Simon Gadient (Flying Bikes), who just pipped last years overall category winner Matthew Wright (Team 3V Racing) by a margin of 56.9 seconds, the closest of the weekend.